When owners of TV shows realize that their products are like airline seats, one plane every seat a different price, they are going to say goodbye to cable television bundling. And the sooner the better. There will be a tipping point where Comcast realizes that they are doomed selling entertainment packages, because the old model doesn’t work any longer. The profits are in the pipe, not the entertainment package they are selling. And they will quickly raise their pipe capacity — 5 8x video resolution capacity guaranteed. Just $59 a month! … Forget this Mbs nonsense. And they will be vastly more profitable than when they were in the break even entertainment package business. This is an interesting idea and might fit into an alternative revenue model I think has potential to replace the current. What if we paid for hours of TV instead of channels? Watch anything you want after prepaying for a monthly block of 20 hours. 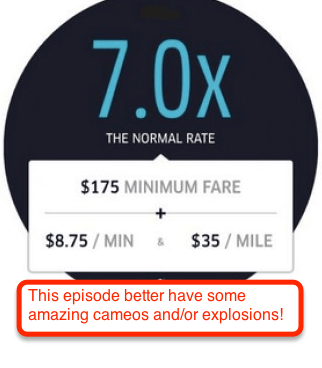 Your surge idea could cost more that 1:1. I believe this will work because it gives creators the opportunity to make more for valuable content and viewers to pay less if they actually watch less.